216 pages | 359 Color Illus. Alex Kelly’s internationally renowned Talkabout books are a series of practical workbooks designed to develop the self-awareness, self-esteem, and social skills of people with special needs. The three Talkabout for Children books, now in their second edition, are specifically designed to provide a foundation of social skills through which children can grow and develop with confidence. 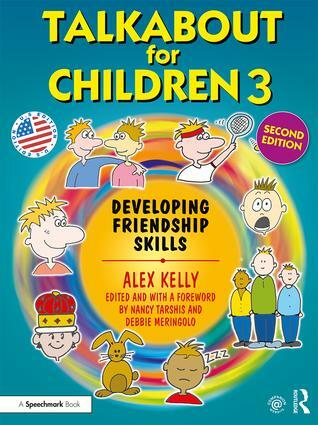 Revised for US professionals, and with a new Foreword by Nancy Tarshis and Debbie Meringolo (Altogether Social LLC, New York), Talkabout for Children 3 focuses on the skills necessary to develop and maintain healthy friendships. This book is an invaluable resource for therapists, teachers, child psychologists, and all professionals looking to develop the friendship skills of children aged 4 + or children with special needs. Alex Kelly is a speech language pathologist who specializes in working with people with social skills and relationship skills difficulties. She currently runs her own business providing social skills training and consultancy to schools and organizations across the UK and overseas. Debbie Meringolo, a special educator, clinician and developmental specialist, is the Director of Early Childhood Programming at The Quad Preparatory School, a school for twice exceptional children, Grades K-12. She assumed this role in July 2018, after a 27-year history as the Associate Director of the Infant/Toddler Team and RELATE program at the Rose F. Kennedy Center Children’s Evaluation and Rehabilitation Center of Montefiore. Prior to her current role at Quad Prep, Debbie served as a consultant, bringing social cognitive programming to the school, developing the social emotional learning program and training staff members. Debbie has a long history working in schools as a reading specialist, supervisor and program developer in the New York City Department of Education for many years. She also runs a part-time private practice, Altogether Social, along with Nancy Tarshis, for children ages 14 months through adulthood. They provide individual and group sessions, consult to public and private schools and training for parents and professionals. Debbie is an enthusiastic speaker who enjoys sharing her own clinical experiences with audience. She has been speaking about social cognitive development, preschool and school age play skill development, assessment and intervention, diagnosis and treatment of individuals with social learning challenges, and developing social programming across the age range across the country. Nancy Tarshis, a speech-language pathologist and special educator with extensive experience working with children and their parents, is the Director of Early Childhood Programming at The Quad Preparatory School, which is dedicated to twice exceptional children, Grades K-12. For 27 years, she was a member of the professional team at the Children’s Evaluation and Rehabilitation Center (CERC) at Albert Einstein College of Medicine, serving as Supervisor of Speech and Language Services for 21 of them. In that capacity, she trained more than 400 SLPs currently practicing throughout the nation. As Emeritus at CERC, she participates in ongoing research and lectures to pediatric fellows, medical residents, and psychology interns. In addition, she serves as adjunct clinical instructor at New York University, Teachers College - Columbia University, and Hunter and Lehman Colleges of City University of New York, and consults on social emotional learning to a variety of public and private schools. Nancy is deeply experienced in a wide variety of treatment methodologies, including Social Thinking. Nancy’s private clinical work includes Altogether Social, a social cognitive practice she co-founded with Debbie Meringolo, that serves clients age 14 months through 22 years. Altogether Social provides individual and group sessions, trainings for parents and professionals, and school consultations. Nancy is a member of the professional advisory boards of New York Zero to Three and Apraxia Kids (formerly the Childhood Apraxia of Speech Association of North America). This bestselling series teaches social, emotional and communication skills for all ages. Written by a Speech and Language Therapist with years of experience working with children and adults with social difficulties, each practical workbook provides a clear programme of activities targeted to improve social skills. The topics are divided into manageable sessions with a range of activities, worksheets and handouts, and each session is introduced with lesson objectives and guidance on how to best use the materials. Ideal for use individually or in group sessions, the resources can be photocopied and evaluation sheets and record forms are provided.